As winter relents and golfers dust off their clubs, Titleist asked Dave Phillips and Dr. Greg Rose to offer a few tips to Team Titleist for preparing for a new season. In the video above, Dave talks about the importance of assessing equipment, but also assessing contact. Of all the abilities that separate professional golfers from amateurs, consistent center face contact is one of the most underrated. While swing speed will always be the most important factor in distance, the vast majority of amateurs are leaving yardage on the table due to suboptimal contact and launch conditions. Take a look at the contact pattern from players of varying ability, courtesy of TPI advisor Liam Mucklow. Quality contact isn’t just the result of sound technique, either. If you’re limited by a strength, mobility or stability deficiency, making a reproducible swing can become infinitely more difficult. For example, if you lose posture in your swing - a swing characteristic defined by the inability to maintain set up angles during the swing - it’s difficult to consistently calibrate the low point in your swing and, as a result, solid contact happens less frequently. While Loss of Posture can be the product of poor technique, it’s usually influenced by physical limitations. At TPI, we advocate that golfers assess and improve their physical capabilities through work with TPI Certified golf, fitness and medical professionals. The better we move, the better potential we have to swing efficiently. Though many golfers are engaged in some sort of fitness program, many programs are self-directed. One of the biggest mistakes we see in self-directed workout programs is that they focus on an athlete’s strengths, not their weaknesses. If an athlete has a disproportionately strong upper body, they are far more likely to program bench press than squats. If mobility has always been a challenge, they probably aren’t eager to submit themselves to a daily stretching routine. A qualified fitness professional can offer value in innumerable ways, but helping to identify your areas of greatest need may be the most impactful in terms of achieving results. They’re writing a fitness program with a sniper rifle, not a shotgun. In sports, it makes sense to play to your strengths. If you’re explosive, make sure you’re taking advantage of your power off the tee. In fitness, you need to play to your weaknesses. We’re often asked what the “best exercise” for golf is. We always answer that the best exercise is to be physically screened. The most important thing you can do in the gym is to work on the right thing. Screening can help you determine what you need to work on. In the video below, Dr. Greg Rose shares four simple screens that you can perform to determine if you might lack ideal physical capabilities for golf. Dr. Rose mentions that some parts of the body are intended to be mobile and others are intended to be stabile. This is a concept we call Regional Interdependence and it is a key tenet in the Body-Swing Connection that we introduce in our Level 1 seminars. If a mobile area becomes stiff, it will “steal” mobility from an area that is meant to be stable. This is the reason why low back or knee pain is often the product of dysfunction in the area directly above or below. 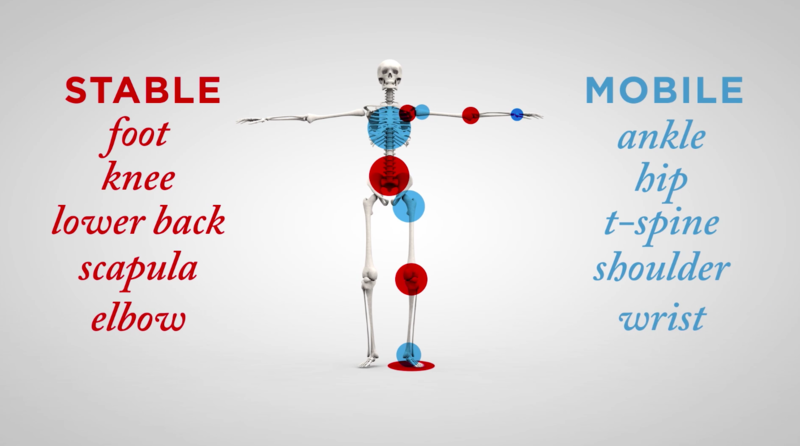 In order to achieve functional movement and maximize durability, stable areas should remain stable and mobile areas, mobile. If you failed any of Dr. Rose’s screens, consider adding the exercises below to your routine. If you’d like to know more about your body and how you can make it more efficient for golf, find a TPI Certified in your area.